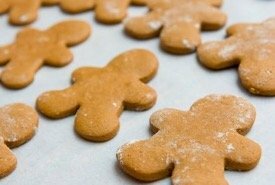 Looking for some cut out cookie recipes that are different from those found in modern cookbooks? Get out your favorite cookie cutters and get ready to make some fashioned cookies in a variety of fun shapes. I'm sure everyone remembers as a kid how enjoyable it was to cut cookie dough into various shapes and watch the cookies brown in the oven. Finally getting to eat them made the day seem so special. Below is an assortment of homemade cookies to make, some basic, some quite fancy, yet all are just as delicious as if Grandma made them herself. So, shake the flour off your old cookie cutters and let's begin. 1/2 cup butter, 1 cup white sugar, 1 teaspoon grated orange rind, 3 tablespoons orange juice, 1-3/4 cups (scant) pastry flour or 1-1/2 cups hard wheat flour. Cream butter and sugar well, add the grated yellow rind from a washed orange, the orange juice, and the well-sifted flour. Chill the dough, then roll to 1/6-inch thickness and shape with floured cutter. Bake in a moderate oven 350°F about 10 minutes. These are quite rich — are crisp and sweet — and have an excellent orange flavour. 3 cups all-purpose flour, 1 teaspoon allspice, 1/2 teaspoon cinnamon, 1 teaspoon baking soda, 3 eggs beaten lightly, 3 tablespoons honey, grated rind of 1/2 lemon, juice of 1/2 lemon, 1 egg white, 36 walnut or pecan halves. Sift flour, cinnamon, allspice, baking soda; stir in eggs, honey, lemon; knead into dough. Roll 1/4 inch thick, cut with round 2-1/2 inch cookie cutter, place on greased pan. Beat egg white with fork, brush cookies on pan with egg white and put nut-half in center. 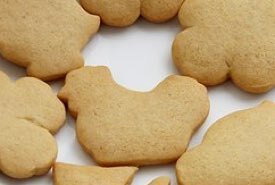 A unique cut out cookie recipe for making delicious preserve-filled cookies. (1) 1/2 cups shortening, 1 cup sugar. (2) 2 eggs beaten, 1 teaspoon vanilla. 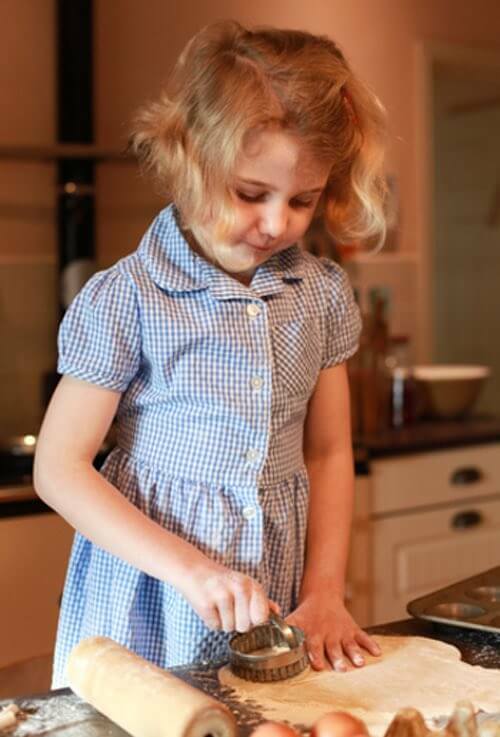 (3) 1 tablespoon milk, 2-1/2 cups bread flour, 1/2 teaspoon salt, 3 teaspoons baking powder. Blend 1, add 2, blend in 3. Chill if necessary, then roll out 1/8-inch rounds using 2-1/2-inch cookie cutter. Put on greased cupcake pans and fill with jam or marmalade. Bake at 375°F until done. 1 cup butter, 1 cup sugar, 1-1/2 teaspoons baking powder, 1 tablespoon cream into which put a pinch of soda, 2 eggs well beaten, flour to roll. Roll thin, cut with small cookie cutter and put two together with the following icing between and a little over top of cake. 1 cup brown sugar, 1/2 cup shortening, 2 cups flour, 1/2 cup sour milk, 1 teaspoon soda, 1 tablespoon molasses. Roll pastry very thin and cut with small cake cutter. Bake. When cool, spread with date filling and press two together in jam-jam style. This lady, Evangeline, says: "Somebody wanted a ginger snap recipe that would stay hard, and not get soft. Use one cup of butter, 1 cup of lard, 1 cup of brown sugar, 1 pint of molasses, 1 tablespoonful of ginger, 1 cup of sour milk, 2 teaspoonfuls of soda, 1 pint of flour — use more flour, if needed. "Melt lard and butter together, stir in the ginger, sugar, and molasses; dissolve the soda in the milk; stir all together, put in the flour, roll out thin, cut and bake in a quick oven." Remarks. —If made sufficiently stiff, properly baked, allowed to get cold, then kept from the air, they will keep hard a very long time.